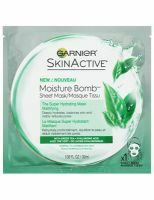 For $3, this mask wasn't bad at all -- it performed probably as well as masks that are two, three or four times its price. I found that it was easy to use (having the removable backing be blue instead of white is such a small but helpful detail) and fit my face well. While on, the mask felt nice and cooling. After the designated 15 minutes, I found that my skin looked nice and the mask had, indeed...read more, produced a mattifying effect, while also adding some moisture to my skin. However, my skin did feel a little tacky (which is something I experience with more masks than not). Though overall this mask didn't change my life, I give it points for how well it performed for the price. If you struggle with combination skin, this mask is for you. It feels light, refreshing and hydrating on your face, but when you remove it your skin is not shiny at all. I love the matte finish.